Amazing hail storm at Gregory Crinum mine!! Hazards are not always easily identified and there is no better example than extreme weather events. Our remote operations have experienced some major climate impacts from cyclones and storms over the past year or two and we have highly developed procedures to ensure continuity of service in all conditions. 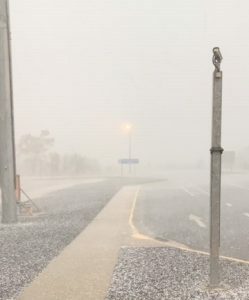 Many thanks to CPA Group Security Officer, Sue Berthun, who provided these amazing photos taken during a hail storm at Gregory Crinum on Saturday 13th October 2018.